Recommended to: Readers who enjoy this series, or like quirky women's fiction. 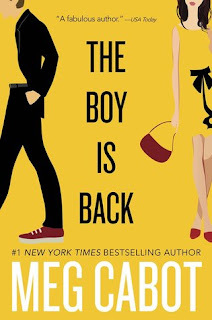 In this brand new novel in Meg’s fan-favorite “Boy” series, a scandal brings celebrity golfer Reed back home to the small town, the crazy family, and first love he once left behind. Reed Stewart thought he’d left all his small-town troubles—including a broken heart—behind when he ditched tiny Bloomville, Indiana, a decade ago to get rich on the pro golf circuit. Then one tiny post on the Internet causes all of those troubles to return…with a vengeance. Becky Flowers loves her small-town life, her small-town business, and especially the small-town wedding she’s planning. She hasn’t thought about her no good high school ex, Reed Stewart, in years. Until suddenly—thanks to a news story that goes viral on every gossip site on the Internet—Reed comes bursting back into her life like an Indiana summer twister. Now everything Becky and Reed thought they knew about themselves (and one another) has been turned upside down, and they—and possibly the entire town of Bloomville—will never be the same, all because: The Boy is Back. I'm a newbie to the "The Boy" series, which I honestly feel may have contributed to why this book and I didn't click as much as I wanted it to. I fully admit that I didn't do my research to find out that this book was the fourth in a series so, although Meg Cabot does do a valiant job of trying to bring new readers in, I spent the first few chapters feeling a little bit lost. Becky and Reed's story took off right from the beginning, which I'm certain is going to make fans of this series extremely happy. There isn't a moment to waste, as Meg Cabot dives into these characters and their own particular brands of quirkiness. Now let me say that Meg Cabot's writing always shines, no matter what book she is writing. She has this uncanny ability to write stories that are equal parts melodramatic and heartbreaking. This book was no exception. Although a majority of this story is written through text messages, email threads, online reviews and journal entries, I could still feel the personalities of the characters shining through. They were funny, a bit cliche at times, but always felt like real, genuinely flawed people. I admit, it made me want to go back and read the first books in this series. My need to know their backstory is strong. On the flip side, my gripe with this method of story telling is that the scenes themselves didn't get as much love. While Cabot was able to show the personalities of the characters through their digital banter, the important scenes in this story didn't get the same benefit. These exchanges were short, and flew by, making it so that there wasn't as much depth as I would have liked. The idea here was wonderful. Two old flames, rediscovering one another. I'm a sucker for that type of story. Unfortunately, although I loved their exchanges, I didn't feel the same kind of love for their actual physical relationship. I wanted that sappy, descriptive kind of writing that makes you want to swoon. I missed that here. So, The Boy Is Back fell right on that middle line for me. I enjoyed the characters, despite feeling lost at first, but I really wanted more from the overall story. I've heard that the first books in this series were more focused on emails, versus today's use of social media, and that makes me want to go back and compare. I feel like the difference is in the amount of emotion that can be poured into a more lengthy exchange, like an email, versus a short text. So I'm definitely wanting to go out and see if I'm right. If you're a fan of this series though, I'm sure you'll love this installment! Like I said above, it takes off instantly, so you won't have to wait long to see what your favorite characters are up to now.